Createspace Independent Publishing Platform, 9781478373322, 60pp. Obbin isn't your average boy, he's a prince of the Blauwe Mensen. What's more he's blue. 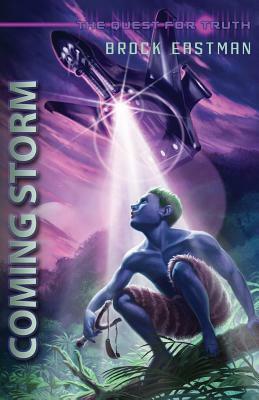 A story from The Quest for Truth series by Brock Eastman, Coming Storm, gives readers a fast paced adventure from the character Obbin. Winning a race against his brother Rylin to the top of a tall Oak tree, he spots a ship falling to Earth. After going against his brother's warnings, Obbin finds himself face to face with the Wikk twins, Mason and Austin, and their ship the Phoenix. When a trade with them goes badly, he nearly falls to his death. Coming Storm was written for the January 2012 issue of Focus on the Family's Clubhouse magazine. This version has a black and white interior.